For the second time this season, France’s top two played out a 1-1 draw. Claudio Ranieri will be without Falcao for the rest of the campaign, and Dimitar Berbatov was only on the bench. He played a 4-4-2 system that became 4-2-2-2 when the wide players advanced, and drifted inside. Laurent Blanc was without Edinson Cavani. He continued with a 4-3-3 system, with his new signing, Yohan Cabaye, also only on the bench. This was a reasonably interesting match, where PSG dominated but Monaco did well to get themselves back into the game and remain outsiders for the title – see Sports Betting Info. 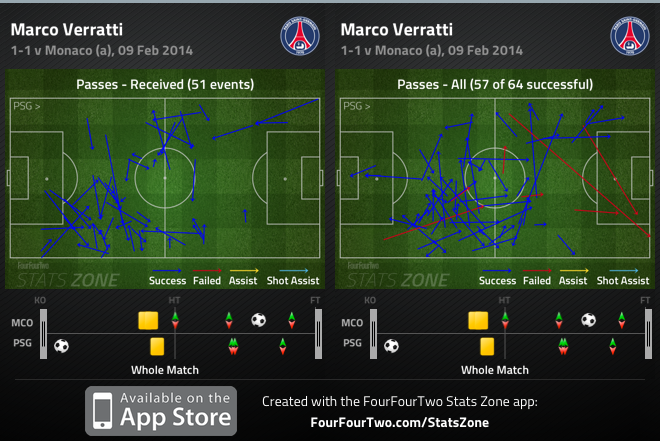 PSG dominated possession in the opening minutes, finding space deep in midfield to control the game. 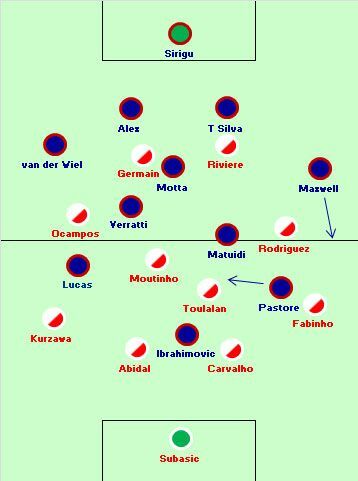 Monaco’s centre-forwards started off playing disciplined defensive roles, attempting to keep the side compact, but Thiago Motta was able to drop away from them to find space, and Marco Verratti moved into very deep, right-of-centre positions to collect the ball (see below). Their discipline allowed the PSG full-backs to advance. In almost every big game PSG have played recently, the advanced positioning of Maxwell has been very important. He pushed on extremely high, taking advantage of James Rodriguez’s lack of interest in defending. He played one dangerous cross for Zlatan Ibrahimovic midway through the first half – those two have an excellent relationship, having played together for four different clubs. Maxwell’s forward running was related to Javier Pastore’s narrowness. The Argentine drifted inside into his favoured number ten position, further helping to overload Monaco in midfield. In the first 10 minutes, Monaco’s system was very boxy and they were unable to deal with players between the lines. Blaise Matuidi made some excellent runs in behind the defence from deeper positions. Pastore turned in a corner to give PSG an early lead, and this changed the game completely. Whereas Monaco previously sat deep and won possession in their own half, now they pushed much higher up the pitch and pressed Monaco in deep positions. This worked excellently. Both strikers are hard-working, and Monaco won the ball from Verratti – previously given as much space as he pleased – to create a goalscoring opportunity for Lucas Ocampos. He was also involved in some excellent play in his usual zone down the left, running past Gregory van der Wiel before crossing dangerously into the box, where PSG didn’t have a spare man and therefore looked vulnerable despite the aerial qualities of their centre-backs. Thiago Motta, superb in the first fixture between these sides, used the ball well but could have contributed more defensively when the ball was wide, getting between the centre-backs to use his height. The more Monaco pressed, the quicker they won the ball and the more possession they had. This was crucial because their best attacking outlets throughout the game were the full-backs, who pushed forward to take advantage of Pastore and Lucas’ half-hearted defending. Both tracked back, but not particularly effectively. Meanwhile, Ibrahimovic was isolated upfront, and extremely quiet. Ranieri, the tinkerman himself, made a drastic change to Monaco’s system at half-time. Surprisingly, he removed Ocampos – maybe Monaco’s most dangerous attacker – because he wanted to move to a narrow diamond midfield, and therefore had no use for a winger. Geoffrey Kondogbia, a hard-working, energetic midfield replaced him – in theory, a negative substitution when Monaco were chasing the game. But this changed the shape of the game. Now Jeremy Toulalan was holding, Joao Moutinho was to the left and Kondogbia to the right. James went to the top of the midfield and allowed Thiago Motta less time on the ball. The surprising thing with the new formation battle was that PSG’s full-backs didn’t advance more, considering they’d appeared so threatening in the first half. 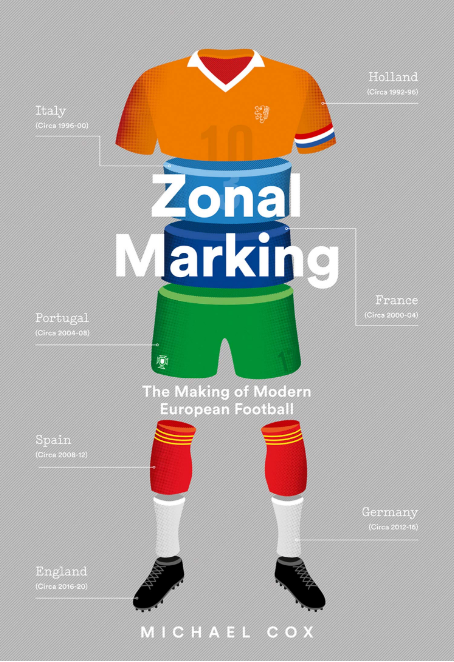 This was partly due to simple lack of adventurousness at 1-0 up, and partly because Monaco were now seeing more of the ball because they had numbers in central zones. Indeed, Monaco’s possession dominance now encouraged their full-backs forward. They were extremely brave throughout the second half, with Fabinho and Layvin Kurzawa practically playing as wing-backs – the latter put one brilliant cross into the near post towards Emmanuel Riviere, which showed the threat. 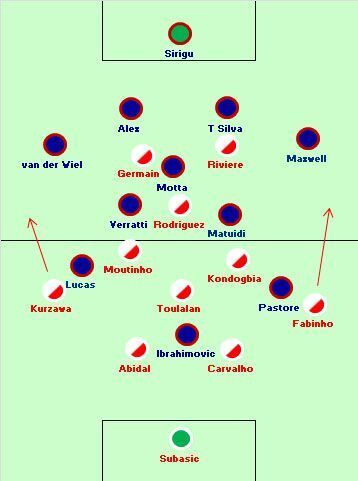 Monaco could afford to play like, though – they had a 2 v 1 at the back against the increasingly isolated Ibrahimovic, plus the protection of Jeremy Toulalan, who had no direct opponent and is comfortable at centre-back, too. This was a 4-4-2 diamond, but not far off a 3-5-2 at times, too. Both sides made substitutions which changed little – Ranieri introduced Dimitar Berbatov for Riviere, while Blanc attempted to bring more tenacity to the midfield with Cabaye on for Verratti. The crucial change, however, was Jeremy Menez’s introduction in place of Pastore. Presumably, Blanc wanted Menez to counter-attack into the space created by Fabinho’s forward darts, but he had a crucial impact in the opposite way. 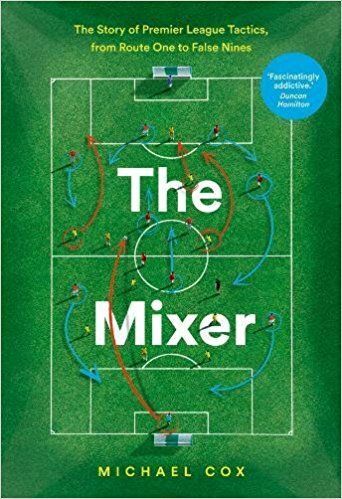 He failed to track Fabinho’s overlapping run, allowing the Brazilian to cross dangerously into the box, and Thiago Silva turned the ball into his own net. In stoppage time, it nearly got worse for PSG – Menez again completely failed to track Fabinho, and only a poor first touch denied the Monaco right-back a one-on-one with Salvatore Sirigu – in the end, the angle was poor and PSG defenders got across to block. But Fabinho’s advanced positioning in the second half was the game’s key feature – and owed much to Ranieri’s switch. A 1-1 draw, but Ranieri got the better of Blanc here. His half-time substitution changed the shape of the game and allowed the Monaco full-backs to overlap into increasingly dangerous positions, creating the home side’s best moments. Blanc, meanwhile, only changed the game in a negative sense with the Menez substitution – this allowed Fabinho to become the key player. Ultimately, however, the draw favours PSG – five points clear at the top of the league. The timeline says Ranieri got the tactics right, and Monaco definitely controlled the game in the second half (Toulalan was constantly free and Matuidi appeared lost on the pitch at times because he was outnumbered), but it felt like Monaco were creating more chances in the first half. Credit to him for settling for the patient approach while he was chasing the score. On the other hand, I was disappointed by Blanc. As you pointed out, the full backs were unambitious, but more importantly, I think he should have switched to 4-4-2 (as he did successfully against Lyon who also played a diamond midfield). Swap Verratti for Lavezzi, play on the break and you’re back to the Ancelotti version of PSG, the players know the drill. It should have been obvious considering that last week, Monaco started with the diamond against Lorient’s flat 4-4-2, and Ranieri was forced to withdraw Obbadi for Ocampos and switch systems at the 25th (!) minute mark because they were being flooded on the flanks. By the way, will you publish soon your piece on Laurent Blanc from the New Managers series? Or have you abandonned the concept? your reviews are coming way too late to remember the game . another thing it would be better if you could tell which game you would be doing next week . This match was played on the evening of Sunday 9 February, & the review was put on the site on Tuesday 11 Februrary. I don’t know Michael’s writing methods, but I’d say that’s a pretty damn good turnaround. So if you can’t remember a match for a maximum of 2 days, I’d say that’s your issue, not his. Do you pay for this service? NO. Then what right do you have to criticize ZM’s timing of reviews or previewing of games? sad to see how Menez has become untrusted in france. The problem with Menez is that he lost speed with his hernia operation. During his first matches, he got dispossessed many times launching a dribble and then unable to accelerate past the defender. He made a couple of good appearances as a sub (especially against Lille), but he wasn’t decisive. And he’s untrustworthy with his defensive contribution. Regarding the change at half-time, Ranieri said that he spoke with Toulalan and the midfielder told him that the team would not be able to press so tirelessly as they did in the first half. Therefore, Ranieri decided to swith to the diamond in midfield, in order to see more of the ball. The change was eventually successful, both in terms of style and in its effect on the scoreline, however, the first half saw most of the chances for both teams. A fairer reflection of the game would have been 1-1 after 45 minutes, and 0-0 in the second half. Anyway, many thanks for covering this, Michael, it’s quite rare to read good analysis of Ligue 1 games !